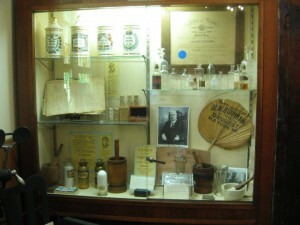 An apothecary display at the Old Town Museum from their permanent collection. The conversion was successful, however, and the Old Town Museum opened on Saturday, June 26, 1976, a little over a week before the official bicentennial date. Within a week of opening, it had registered visitors from 12 different states. Because the response to the Museum had been so positive, the City kept it as part of the Parks and Recreation Department until 1982, when the City Council voted to get out of the museum business. However, a group of dedicated supporters formed a nonprofit corporation to continue the Museum, and the City agreed to lease the Waterworks Building to this group dedicated to preserving the heritage of Old Town and its surrounding communities. The Old Town Museum remained in the Waterworks Building for 20 years, until the space became cramped and limiting. There was insufficient space to exhibit or store historic materials which had been donated, and the Museum sought a larger and more appropriate home. In 1996 St. Mary’s Church became available as Old Town’s two Catholic parishes merged and consolidated into the larger of the City’s two churches. The Museum Board voted to purchase the church, which was larger and more centrally located than the Waterworks Building. A combination of a successful capital fund campaign provided the necessary funding for the acquisition, necessary renovations and moving costs. It became, and remains, an all-volunteer organization, lead by a Board of Directors, and a 501(c)(3) organization with an active support membership. 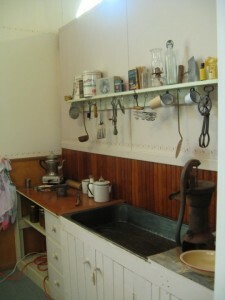 Old Town Museum kitchen display. Since its move to Main Street, the Old Town Museum has undertaken some noteworthy projects which showcase the history of the area. In conjunction with the University of Maine Folklore Department, 22 hours of interviews were filmed with first-person reports of 11 older citizens about items they remember from their childhood. The final product, a 30-minute video, was funded by a grant from the King Foundation. Other projects have included a digital archive of 200 historic photos of the region, which is continually being expanded, and a periodic newsletter which features information on historic moments and items from Old Town’s past, as well as information on the Museum’s current exhibits. A modest gift shop was opened to help support operating costs, featuring books on local history, historic postcards and other items of interest for purchase. The Museum also hosts numerous programs for the community, from the “Sunday Afternoon Program” series of entertainment and educational offerings to workshops on historic topics from genealogy to the history of local religious communities. These programs provide an opportunity for community members to participate and visit the museum in a more involved way, and enjoy the changing displays. 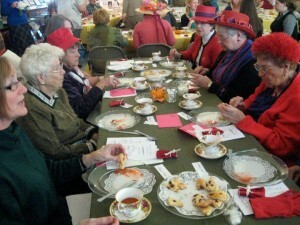 The Museum has become known for it’s Strawberry Festival and Autumn Tea, as well as events outside of the season. Displays at the museum are taken from it’s permanent collection and items on loan from local individuals and organizations. Some of the permanent exhibits feature Old Town’s past in the lumbering industry; materials and equipment from a variety of past professional establishments; simulations of rooms in early homes; wood carvings of Old Town artist Bernard Langlais; and a prized historic birch bark canoe. Ladies enjoy tea, scones and delicious treats at the annual October Autumn Tea at the Museum. Past displays of on-loan items have included historic items from Old Town’s religious communities; handmade recreated crafts of the middle ages by the local Society for Creative Anachronism; historic clothing arrangements; and special arrangements by other historic preservation groups in the surrounding community. New displays are created each year to showcase different items in the permanent collection and give organizations an opportunity to share their stories and history with the community. The Museum created as a “Bicentennial Activity” has resulted in a wonderful asset to Old Town, far beyond what had been originally envisioned. It continues to be a reminder of our shared past, and provides visitors a glimpse into the past; a place where older generations can reflect on the way things were and younger generations can learn about the stories and past which have made the Old Town community what it is today.